Down to the wire, err, thread? I’ve been very overwhelmed lately. Sadly, it doesn’t take much when you’re fighting with chronic pain and fatigue. I knew my brother’s birthday was approaching fast, but I didn’t have a clue what to do for him. Last Thursday, I went to a lecture put on by Open Minded Skeptics and Pikes Peak Urban Gardens on organic gardening in the Pikes Peak region. I used to be quite active with the Bear Creek Community Gardens before I was disabled. I would really like to grow my own food again. Salad goes from blah to the tastiest lunch ever when it’s home grown, fresh, and full of flavor. I plan on having a large, accessible garden south of the gravel driveway where we’re building the cabin. A free refresher lecture seemed like a great way to get me out of this basement. I hate being stuck in the same little box of a space day in and day out. I envy even those who go from home to a cubical and back five days a week! Anyhow, after the talk was over at 8:30 PM, I found myself at the library with a half hour until closing. I figured I might as well browse a bit. I always check to see if there’s anything I haven’t seen in the knitting section. There wasn’t this time, but I ended up checking through the neighboring embroidery section too since many embroidery charts are similar to knitting charts like I design. 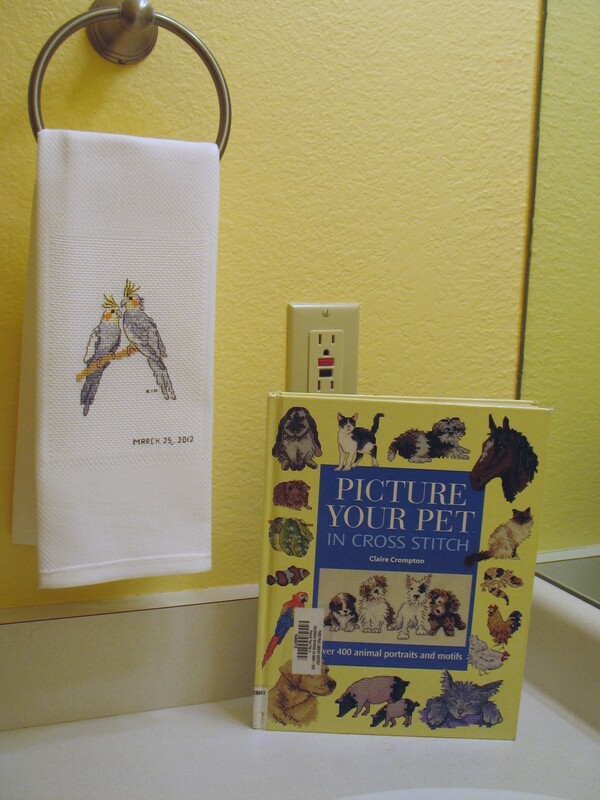 One book, Picture Your Pet in Cross Stitch by Claire Crompton jumped out at me. I flipped through it and saw a picture of two cockatiels that look almost exactly like my brother’s pair. 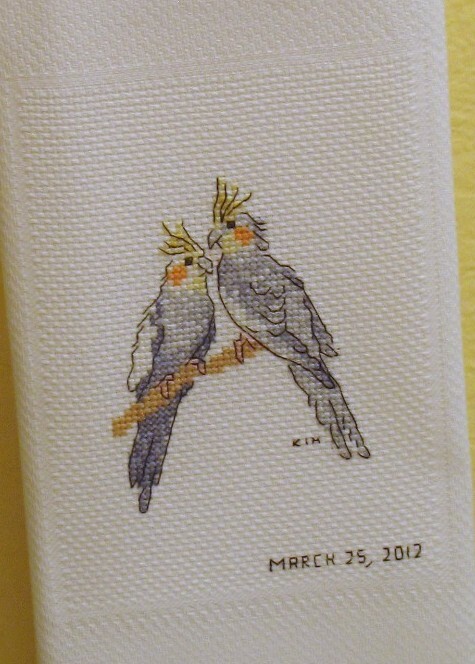 I’m not a fan of cross stitch, but I brought it home with me anyhow. On Saturday, I realized that my brother’s birthday was the very next day sometime in the late afternoon. Worried about what I could possibly do in that time frame on no budget, my mind wandered back to the cockatiels. I checked my meager box of embroidery floss to see what colors I had and what I needed from the store. I went to Hancock Fabrics first and saw a towel with a centerpiece of aida cloth woven in and decided that would be a much better idea than buying aida cloth and trying to get it framed and matted up in time. Since I had a 40% off coupon, it was certainly a cheaper option at only $5 after tax! Hancock Fabrics carries a terrible off-brand embroidery floss though. It doesn’t have the luster of DMC floss so I hopped in the car and drove on to the nearest Hobby Lobby to get real DMC floss. When I got home, guy pal met me there to help me figure out how to work on my Maple Wool Farm logo in Photoshop. It’s a pain, but I’m making progress. I was finally able to sit down and start working on my brother’s birthday towel around 8PM on the 24th. My mom helped make sure the design was centered right on the canvas. I HATE starting out on a new cross stitch project because I hate trying to get the design centered. I worked until about 4AM with a break to make some boxed macaroni and cheese I found in the back of my cupboard. Finally, I was too tired to keep going. I was starting to make mistakes. I got to bed just after 5AM and was out of bed again by noon after a fitful sleep as usual. By 12:30PM, I’d checked my email and gotten back down to the stitching. Around 1PM, I finished all the cross stitching and by 2:30PM, I’d finished all the back stitching and was heading off to iron the piece. Near the end, I even decided that maybe cross stitching isn’t so bad. It uses a fair bit of shoulder movement, but didn’t irritate my shoulder pain. I’m actually thinking I should cross stitch more just to work my shoulder more. I’ll have to look into software to design my own cross stitch designs though so I can sell my finished work. I decided to take pictures in my mom’s half bath upstairs because the yellow of the walls really punches up the towel. I also suggested to my brother that he pick up a yellow towel to put behind this one to frame it nicely on his towel rack. Working with that many shades of grey so close together in value was a pain, but the lifelike result was really worth it! Then I finally got to move on to wrapping. I consider wrapping to be an important part of a handmade gift. It’s like the packaging selling a product at a shop. I picked out two bottoms of folding Christmas boxes to make one white box. 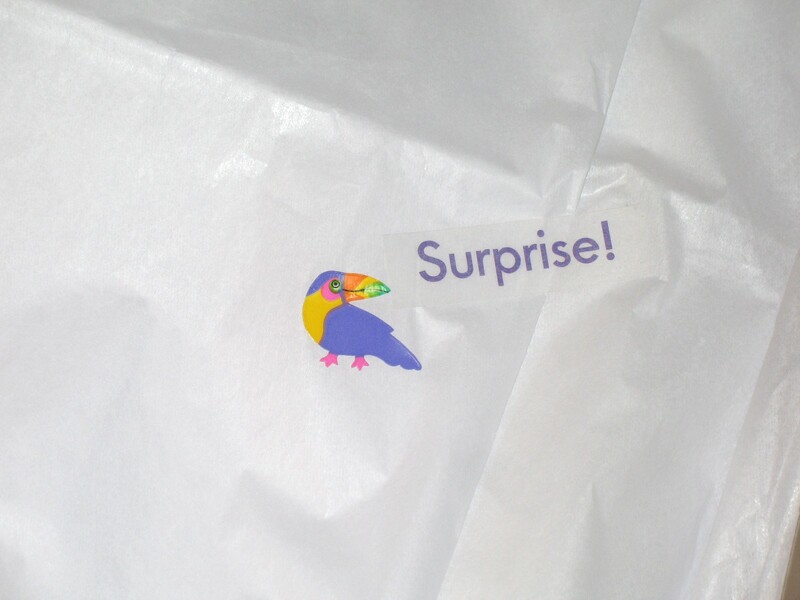 I lined it with plain white tissue paper. To spice it up a bit, I used a couple scrapbooking stickers inside as the seal to hold the tissues closed, just like something fine from a very upscale shop. With the work I put into this towel, it would have to come from one hell of an upscale shop! 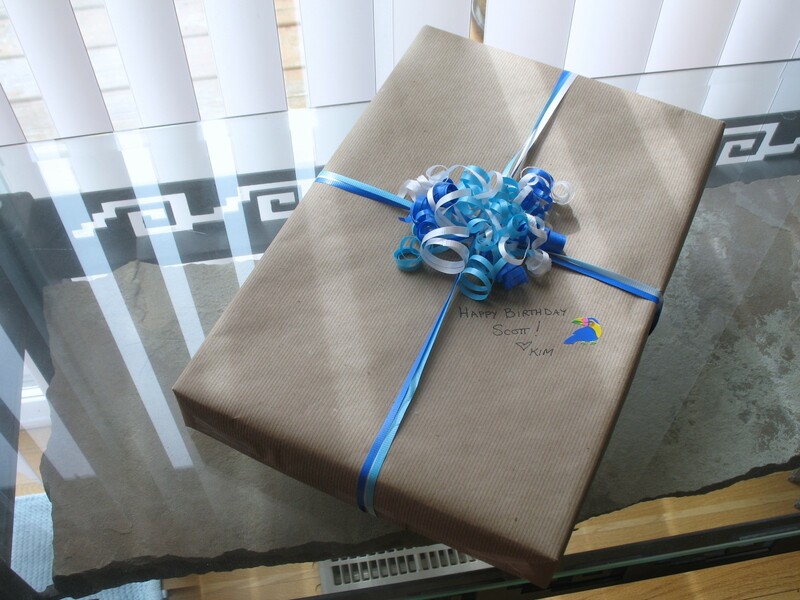 Then, since I don’t have any manly birthday wrapping paper, I used some faintly striped brown kraft paper and some curling ribbons. I added another sticker to the front of the package in place of a card since my brother was ringing the doorbell as I was finishing up the bow! Not too shabby for a last minute gift, huh?